The report I heard on the radio said the gunman was dead after a firefight with French troops. I have it on youtube, but ............. nah. Sounds like they know who it is but haven't found him yet. Muslims are particularly challenged by those notions. Was supposed to be picked up and questioned this morning about a homicide. 'At least 4 dead'.......... 11 wounded. Looks like that's dropped, thankfully. Police in France have revised down the number of people killed in a shooting in Strasbourg to two and say six people have serious injuries, according to Sky News. From the link above 24 minutes ago. 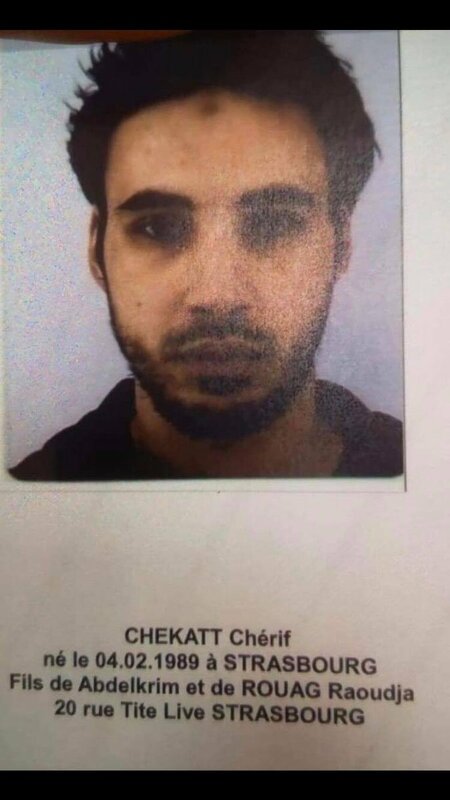 French media is reporting that the shooter, identified as 29-year-old Cherif Chekkat, a French national of Moroccan descent, remains at large. A statement by local French police says the shooter is from the notorious Neuhof neighborhood, a hub of Islamist radicalization and a known "no-go" zone. It also states that he was categorized on their terror watch list as "fiche-S," meaning known to be a radicalized militant.